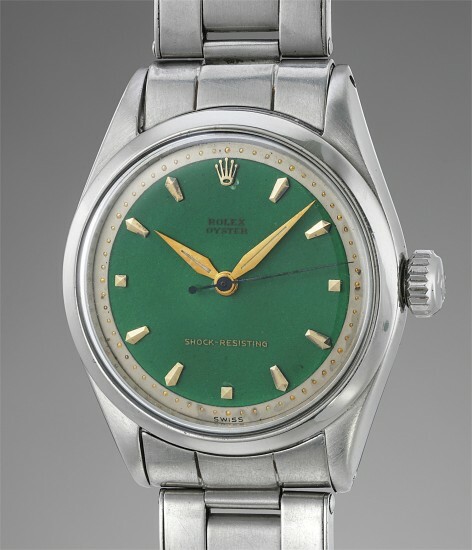 This wristwatch most notably features a green hard enamel dial, the quality of which is outstanding. The color appears bright yet translucent and has an even, rich and saturated tone. Every detail is taken into account. The enameller has painted a perfect and small circular ring around the center post where the dial plate meets the enamel, attesting to the meticulous work of Stern Frères. Founded in 1868 by brothers Charles and Jean Stern, Stern Frères is best known for creating beautiful and intricate dials for watchmakers such as Patek Philippe, Vacheron Constantin, Rolex and Omega. The back of this dial is stamped by the esteemed dial maker. The first three numbers, 103, denote the watchmaker's reference. In this instance, it would be Rolex. The star represents the maker, Stern Frères, and the following numbers are the job reference.